The Titan Speeflow Powrliner 800 (Powerliner) is an affordable entry level basic line striper capable of spraying quality lines for smaller jobs on pavement, grass or turf. It weighs only 65 pounds and has a simple, compact design making it easy to transport and handle on the job. Powered by a dependable Robin-Subaru 4 stroke engine. (1.6 horsepower) The Speeflow Powrliner 800 is equipped with an LX-40 spray tip that is removable and attached to the machine via a 25 foot spray hose. 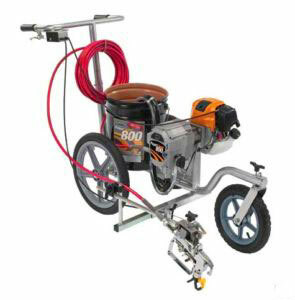 This allows the user to detach the spray gun and spray stencils, car stops, and curbing. This entry level Titan machine is designed to carry a 5 gallon bucket just like the larger machines. It also has an adjustable swivel front wheel like the more expensive parking lot striping machines which enables you to do straight and curved stripes. The pros of this machine are that it is affordable and does a decent job of laying down stripes. The cons are that it is a less powerful machine and is not designed for high production work. You may need to thin your paint a little since the 800 series pump is quite small. Also, it is also not a machine that a novice could work on themselves like the Trueline machines by Trusco Mfg. Weight Unit / Unit Crated: 65 lbs. / 75 lbs. The Trueline Family of stripers are rugged and capable machines. They are very affordable yet fully capable of doing commercial work. Because of their simplicity any one can work on the machine and downtime is close to zero. Click here for information and pricing on the Trueline Striper. Trueline Stripers by Trusco are easy to use and very affordable alternatives to more expensive gasoline powered line stripers. Unlike the Graco, Kelly Creswell, Proline, Airlessco and other gasoline machines Truelines are easy to maintain yourself with no shop repairs required. The Trueline striping machines use a stainless steel pressure tank where thinned paint is fed into a paint box that slides along the ground. The box makes it possible for the machine to produce a nice clean line even in windy conditions. Trueline stripers have been around since the 60’s and are great for small to medium sized parking lots. They will do commercial work but may lack some of the extra features that the more expensive machines have. For putting lines down on the ground they are great. “I have personally used the Trueline machine and highly recommend it.” I had the 250 model and used a roller and a separate sprayer for curbs but it has never been a problem. If you do not want to use a roller then I recommend the Trueline Model T-2000. It has a very nice spray unit built in to it. If you are looking for a very economical way to stripe either your own parking lots or do some commercial work then the Trueline Paint Striper is a machine to look into.